Red Sonja (1985) | 'TAIN'T THE MEAT… IT'S THE HUMANITY! The Taint The Meat Eighties Fantasy Movie Season rolls ever onward with this week’s entry, the disappointing Red Sonja from 1985. During his tragically short career prolific pulp writer Robert E. Howard created several memorable characters, the most well known and enduring being Conan the Barbarian. After the Cimmerian rabble-rouser Howard’s second most enduring character is the flame-haired sword-wielding heroine Red Sonya — although the character people are most familiar with isn’t strictly the one Howard originally created. Roy Thomas and Marvel Comic’s version of Red Sonya, from Marvel Feature #6, September 1976. Red Sonya (spelled with a ‘Y’) first appeared in the short story, The Shadow of the Vulture, published in 1934. The story was set in Renaissance-era Istanbul with Sonya herself only appearing as a secondary character; and once the story saw print she was quickly forgotten. That is until 1973 when Marvel Comics writer Roy Thomas and artist Barry Windsor Smith resurrected the character, transplanting her to the Hyborian Age of Conan for their hugely successful Conan The Barbarian comic. 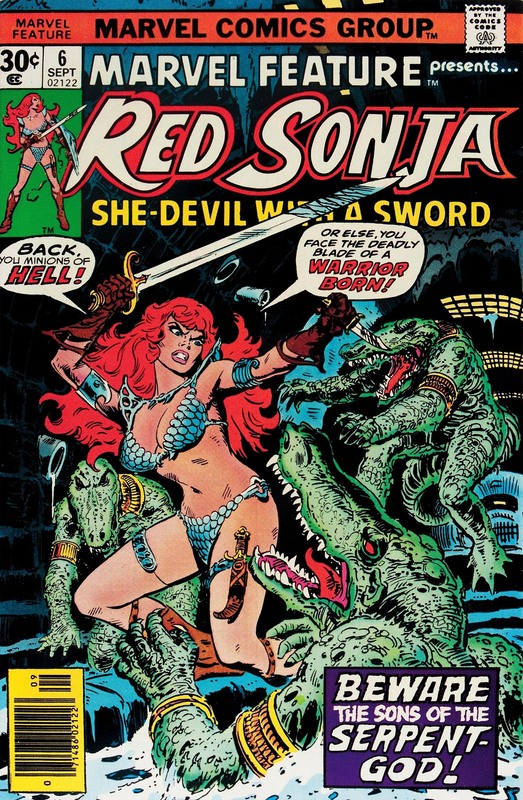 This new Red Sonja, sporting a different spelling of her name as well as a revealing chain-mail bikini, quickly became a fan-favourite and the She-Devil with a Sword was born. Jump forward a decade: the first film adaption of Conan the Barbarian (1982) has proved a surprise hit, as has its somewhat drab sequel Conan the Destroyer (1984). The idea of adapting another Howard character seemed like a no-brainer, thus allowing Red Sonja the chance to strut her stuff on the big screen. Would Sonja prove as popular with cinema-goers as Conan? Could this be the birth of a new breed of powerful, empowered female film heroes? Sadly, the answer was a resounding ‘no’. Starring Brigitte Nielsen (in her first screen role) as Sonja, and supported by Conan star Arnold Schwarzenegger, Red Sonja was a disappointingly straightforward and lifeless revenge flick. The plot (if you can call it that) was pretty basic. The evil Queen Gedren (Sandahl Bergman) lusts after farm girl Sonja, who spurns the Queen’s advices. As punishment Sonja must watch as her home is destroyed and her family murdered. She is then raped by Gedren’s soldiers and left for dead. Before she succumbs Sonja is awoken by a ghostly angel/spirit thing who grants her the strength to seek revenge on Gedren (I’ve no idea what the ghostly apparition actually is, and its appearance is never explained). Sonja then sets off to became the deadliest of warriors and avenge herself on Gedren, who in the meantime has stolen a powerful green relic (The Talisman) with which she plans to conquer the world. Sonja teams-up with Schwarzenegger’s Lord Kalidor, and the young prince Tarn and his servant, Falkon. They all journey to Gedren’s palace, prevailing against various obstacles along the way before Sonja kills Gedren and destroys The Talisman. 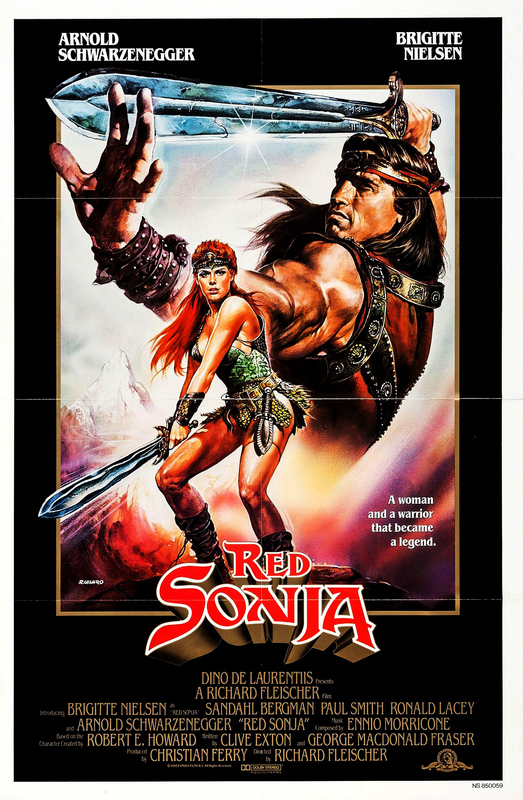 Even though I’m a great fan of Sword and Sorcery flicks from the 1980’s, I just can’t recommend Red Sonja — it’s crap. It isn’t even a good ‘bad’ film, it’s just bad. The plot is flat and boring, here’s no character development, little understanding of the main character’s motivation past revenge, and even though it’s only 88 minutes long it still drags. On top of that Nielsen’s acting is atrocious; she’s OK with a sword but that’s about it. The film’s producers clearly realised early on in the film’s production that she wasn’t much cop and so increased Schwarzenegger role, he even appears bigger than Nielsen on the film’s poster. What’s most galling though is the Sonja from the film bears no resemblance to the character from the comic, who is smart, strong and resilient (silly bikini notwithstanding). The comic version of Sonja is more than capable of defending herself, whereas the movie version is constantly having to be rescued by Schwarzenegger’s Kalidor. I appreciate that Hollywood doesn’t have a great track record when it comes to strong female characters but it can still do better than this. (And to anyone who may still be tempted to watch the film, I recommend they watch the trailer instead — it pretty much gives away the entire film, including its ending). ‘No man may have me unless he’s beaten me in fair fight’. There’s also a unpleasant vibe to this film. Sonja is told repeatedly that she’ll never be truly happy unless she lets a man back into her life (and her bed) — not exactly empathic advice to give to a victim of violent sexual assault. And Queen’s Gedren’s lesbianism is clearly meant as an indication of how truly evil she is; even in the relatively unenlightened mid-eighties this rang an unpleasant note. There’s very little to commend Red Sonja, which is surprising as there was some serious creative talent behind the film. It was directed by Hollywood veteran Richard Fleischer, who also directed Tora! Tora! Tora! (1970) and 10 Rillington Place (1971), as well as one of my all-time favourite science-fiction flicks, Soylent Green (1973). George MacDonald Fraser, author of the Flashman novels, co-wrote the script, and the film’s score was written by legendary composer Ennio Morricone, who wrote the music for A Fistful of Dollars (1964), The Good, The Bad and The Ugly (1966) and Once Upon a Time in America (1984). Yet despite all this talent the film is flat and never grabs the audience’s attention: Fleischer’s directing is more precise than engaging; Fraser’s dialogue is uninspired and, at times, laughable, and Morricone’s score, when it appears at all, is lifeless. It seems that on Red Sonja everyone was off their game. Danilo Donati’s production and costume design from Red Sonja. The one, and only positive recommendation I can make about Red Sonja concerns Danilo Donati’s production design, which is superb. 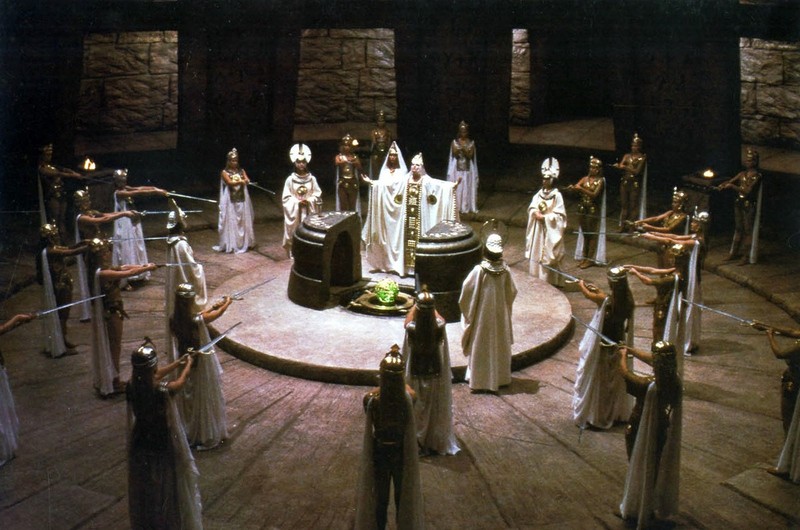 Donati, who had also worked with Franco Zeffirelli and Federico Fellini, brings a real sense of grandeur to the film, and the interior sets are large, beautiful and wonderfully detailed. Everything from the monastery that houses The Talisman, to Queen Gedren’s throne room, to the large candle chamber are grandiose and impressive. The same goes for his excellent costume design; it’s just a pity that the film itself couldn’t live up to the high standard set by Donati. It’ll come as little surprise to learn that Red Sonja died a death at the box office, and was also savaged by critics. Ordinarily, when it comes to Sword and Sorcery flicks from the Eighties, the opinions of critics wouldn’t bother me too greatly (after all, they rarely warmed to fantasy flicks from that period) but this time they were spot-on (Schwarzenegger himself reckoned Red Sonja was the worst film he ever made, which speaks volumes to its quality). I very much doubt this will be the only time Howard’s red-haired hero appears on the big screen, but I sincerely hope that when a new Red Sonja (or Sonya depending on which version is being adapted) film does eventually appear, it’s better than this. It’s hard to see how it could be worse. Next: Fantasy meets romance in Ladyhawke, from 1985.